Numb3rs is a crime-drama television show produced by Ridley and Tony Scott that stars Rob Morrow and David Krumholtz among several others. Morrow plays a FBI special agent who has a brother who is a mathematical genius who helps him solve crimes for the FBI. The show focuses greatly on not just the crime solving, but on the intertwined relationships within the show. Unlike most other shows, Numb3rs focuses a large part on the equal relationship and human aspect of the characters as well as the actual crime solving. Numb3rs employs basic and advanced logistics and mathematics to show how it relates to everyday life in more ways than the average human being realizes. The show does not institute fake or made up equations just for ratings sake either, as the show employed several mathematicians who consulted every episode and made sure that the math was relevant and checked out as factual. We are constantly reminded of how relative math can be in crime solving, and are shown this unique and alternate view to crime solving several times in each episode. Though the show seems to focus on the two brothers, there were plenty of other integral characters that added to the unique formula. The brother's father, Alan (played by Judd Hirsch) was also key in helping the boys solve the crimes and develop both of their characters as well. As previously mentioned, the relationship between the brothers and their father is treated equally to the brothers own relationship with each other. The family is not the only personal character relationships that develop either. Besides the numerous professional relationships formed between the group, a romantic relationship evolves as well. Starting in season two, we see Charlie and another mathematician and FBI consultant, Prof. Amita Ramanujn (Navi Rawat), adopt a love relationship of their own that blossoms and unfolds throughout the shows life, eventually culminating in a marriage between the two! To speak to the shows credentials, it has been nominated and won several awards in many different categories. The biggest awards may not have been of the Hollywood style either, as the show has crossed over and also won science awards as well! It really is a very unique and science driven entertaining learning experience! Don and the team investigate when his lost gun is used to commit a series of crimes. The murder of two men takes the team to investigate a group of friends that had been sexually assaulted by a teacher at a younger age. Meanwhile, the perfect job opportunity pops up for Charlie and Amita, that may also put a wrinkle on their wedding plans. The FBI investigates a number of jewelry thefts at awards shows, but are thwarted in their attempts by uncooperative witnesses, celebrity has-beens and fake gems. The team hunts down a serial killer who is targeting men who use prostitutes. Meanwhile, Colby and Nikki are involved in a car accident during the investigation. The team searches for a lost shipment of high-caliber firearms when one of the weapons is responsible for random killings throughout the city. Don and the team try their luck at investigating the theft of scratch-off lottery tickets, but the stakes are raised when one of the culprits killed at a botched robbery turns out to be a former lottery winner. When the team foils a robbery of an armored car full of Federal Reserve money and recover bills that trace back to the infamous D.B. Cooper heist, they call on retired Agent Roger Bloom for help. Don and the team needs help from convict John Buckley when robbers hit a diamond exchange and take hostages. They believe the robbers are copying Buckley's criminal strategies. In the middle of a case where Agent Ian Edgerton is tracking down a criminal in charge of a heroin ring inside a prison, his informant is found dead. Agent Edgerton unexpectedly turns into the murder suspect, which sends him over the edge. The FBI team investigates a decommissioned air base that has recently observed mysterious paranormal activity. While looking into a woman's death, spooky occurrences change the tone of the investigation. When men across the country turn up dead, the team investigates a deadly gambling ring that is running a high-stakes Russian roulette tournament. Also, Don and Charlie become concerned about Alan's financial health. Don's team is called in to investigate when several FBI agents are killed in a firefight with bank robbers. Meanwhile, Larry makes a decision that worries Charlie and Amita. While Charlie waits for an answer to the question he popped to Amita, Don and his team try to hunt down a sniper intent on killing someone under FBI protection. When Amita is abducted, Don and the team's frantic search for her leads them to the delusional head of a cult, but it is up to a distraught Charlie to discover what the suspect's bizarre plans for her are. Still reeling from Don's brush with death, Charlie aims to redeem himself by tracking down a serial killer. There are dire consequences when Charlie messes up some calculations during a case and his brother is injured due to Charlie's mistake. Episode 19 - 12:01 A.M. The team is in a race against time to look into a last minute tip that would clear a mob boss on the night of his execution. Meanwhile, Charlie tries to help the CalSci basketball team break their losing streak. When a super computer is to blame for the death of a scientist, the team goes to new lengths to solve the case. Meanwhile, Charlie contemplates a job offer. When one of Robin's "slam dunk" cases ends in acquittal, the team investigates, thinking it may be jury tampering. The team finds themselves in the world of sneaker collecting after a foreign ambassador's vault is broken into and a limited edition pair of sneakers is found missing. The team has only four hours to stop a group of hijackers who take a bus full of Hollywood tourists hostage. Don looks toward his newly found religious beliefs to help him contend with a escaped criminal bent on revenge. Charlie must team up with his arch rival-Marshall Penfield to solve a case. Meanwhile, Don is still struggling to decide whether his religion holds the answers he's been looking for. The headquarters of a popular charity organization is bombed. However, what seems like an act of terror may turn out to be something else, when Don, Charlie, and the team begin to unravel mysteries behind the organization itself. David gets caught up in the drama of a missing persons case when the victim, a magician, disappears while David is watching her show. There's a bad egg in a shipping business, and it's up to the team to find him. Also, when one of Don's agents is killed, Don begins to question his job as a leader. The team hunts a crew stealing high-end goods from a shipping service and looks to an employee with savant-like abilities to lead them to those behind the scheme. Also, when one of Don's men is killed on duty, he questions his faith in the FBI. Don and his team are called in to help a veteran FBI agent track down a con man who has eluded him for years. Also, Agent McGowan hands down his decision on Charlie's security clearance and Don's future with the FBI. When eight people, including two police officers, are executed in a coffee shop, an LAPD detective gets the team on the case, and they uncover a trail of blackmail, romance and corruption. Also, McGowan's investigation of Charlie and Don deepens. Don investigates when someone is murdered at an ATM after a series of kidnappings had occurred there. Charlie meets with an FBI investigator who can grant or deny him a security clearance within the bureau. Don and his team search for the people responsible for the deaths of two rock climbers who had a large diamond in their possession. Meanwhile, Charlie debates getting his FBI clearance reinstated as a new agent joins the team. 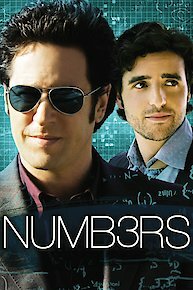 Numb3rs is currently available to watch and stream on CBS. You can also buy, rent Numb3rs on demand at Amazon Prime, Amazon, Hulu, Vudu, iTunes online.